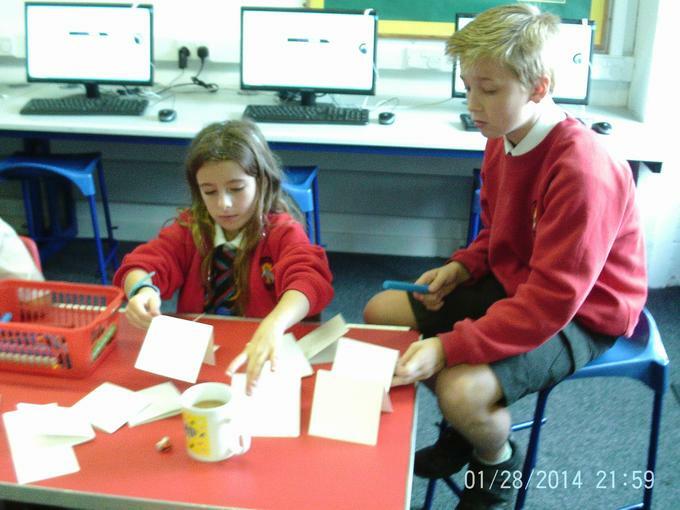 We've been busy again making Christmas cards for our school community. We've had some great meetings so far. We have discussed asking for an extra playtime for the juniors on a Friday afternoon as a reward for super effort all week in class. We will also be creating Christmas cards for the school community and planning some fundraising activities. We are so excited to meet our new school councillors. We have already had our first meeting and we've got lots of great ideas for this year and our school. Keep checking our page and display board to find out more. Getting ready for another cake sale. The school council, with the help of Y6 did a fantastic job of running our first cake sale of this academic year. We raised over £60 for Broomfields Youth Project Charity. Thank you to everyone who came to buy cakes and support us. We are excited to be launching our new cloakroom monitor reward scheme. More details to follow in the next School Council assembly. Later in November, we will be hosting another CAKE SALE to raise money for Broomfields Youth Project. Please support this great cause by buying some cakes. We are very excited about the year ahead! Your school councillors are busy planning and preparing. Please let us know if you have any ideas. We will meet every Thursday at 12.00pm in the computer suite. 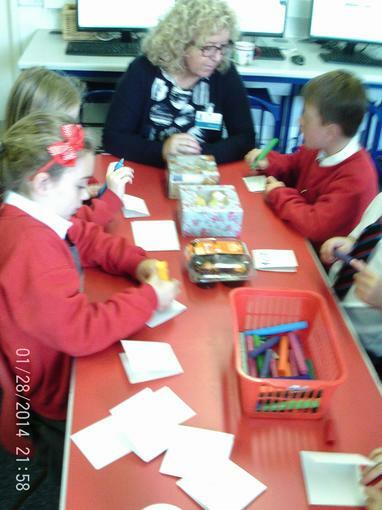 School Councillors- you will have lunch after the meeting. If you have any suggestions for the School Council please speak to one of the School Councillors or write a note in the suggestion box. School Council awards will be announced next week...... don't forget to vote!!! This term we are finding out how to keep ourselves healthy. Mrs Neill came to work with the School Council - we talked about foods that were healthy and foods that we not as good for us. 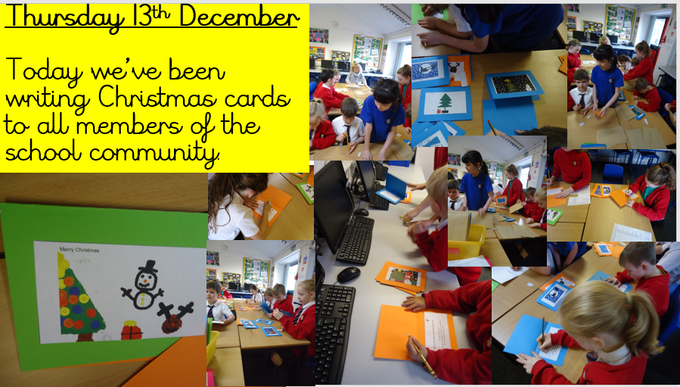 We made Christmas cards for all members of the school community. We have been busy thinking about how we can improve our school. We talked to the whole school about our charity form. Well done to all of the children who won a School Council Award. Keep up the great work. We are so proud of our super school councillors- thank you for doing such a great job. School Council Award winners will be announced on Friday 6th May during our Celebration assembly. School Council will be looking at the nominations this week and we will decide who will be awarded with a SCHOOL COUNCIL AWARD. We would like you to nominate children in your class or another class that you think deserve a SCHOOL COUNCIL AWARD. School Council Awards are similar to our Good Citizens reward. Good Citizens are chosen by teachers but School Council Awards will be chosen by your School Councillors. The School Councillors will go through all of the nominations and decide who should receive the award. Please speak to your School Councillors or Mrs Pawson for more information. We've been busy designing Christmas cards using Purple Mash. This week we are going to be writing and sending our cards. Have a go at designing your own Christmas cards using Purple Mash- 2 paint. We met in the area that is being considered for use as a quiet area. These are the ideas we came up with, but they are only a starting point. The area is the grassed area between the school and playing field on the west side of the school. It will finish at the corner of the wall, to enable staff to have a clear view, and take in the small grassed area alongside the hedge, leading to the main playground. Removing the hedge as it leaves the area in shade, and makes it narrower. It could be replaced with a lower fence or trellis. Something is needed to separate it from the main playground, but the area needs to be fully visible from the main playground for safeguarding reasons. The outside classroom could go at the point furthest away from the playground. Any seating that is not on the edge should be light enough to move, so that empty space is available when needed. The wall could have a mural or a graffiti area. There could be planting of a sensory area. Colouring / art equipment. We thought that we should avoid anything that may be blown around by the wind, create a lot of scraps of paper or rubbish or require supervision (such as scissors and glue). It does not have to be called the "Quiet Area"
The school council members will discuss ideas with their classes. We want to know what other ideas people have. We may need to think about rules or a code of conduct for using the area. Linda Buckley will arrange to look at other schools with quiet areas and visit with some school council members. Any other ideas or suggestions will be really welcome. A big thank you to the school council who raised £105.47 from the cake sale. Thank you also to Class R parents who provided lots of the cakes. Cake Sale Friday 23rd October in Class 3 after school. Come and buy some cakes and help us to support Operation Christmas Child. We collected 142 Shoe Boxes for the Samaritan's Purse Appeal - Thank you everyone! We will meet every Thursday at 12.30pm in the Computer Suite. School councillors- please make sure you go for lunch straight away.